There's a book called "The Millionaire Next Door" that gives all the citations you could ask for on this topic. It basically corroborates what you're saying -- wealth usually doesn't last past the 2nd generation. Most people don't become millionaires through inheritance, extreme income, and so forth; they become millionaires because they save more than they spend, usually by a substantial amount, invest widely, buy a house and keep it, and marry and don't get divorced. 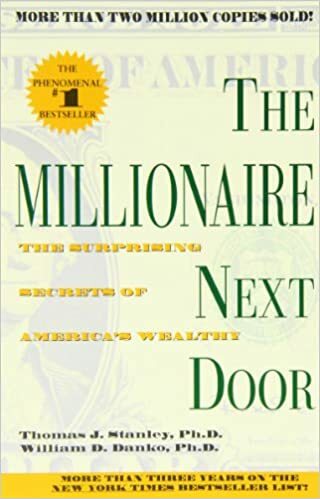 Stanley and Danko's book The Millionaire Next Door describes this phenomenon: http://www.amazon.com/Millionaire-Next-Door-Thomas-Stanley/d... and what wealth in America actually looks like. Story of my life, Ed. I am your poster boy who lives "cheap" and not "frugal" by choice. I clip coupons and browse slickdeals before committing to a purchase. I never buy anything at MSRP. I monitor airfare prices for weeks before booking a ticket. - When you're already on a fixed salary, the opportunity cost of spending time on being cheap is not obvious. You're not taking time away from that $500/hr side consulting gig that you don't have. Instead, you're at a situation where the marginal rate of return on clipping coupons (say, $10/hr) is significantly better than spending the next hour working on that iPhone app that is months from release and has no interested buyers (how long is it going to take to recoup the Apple developer fee?). - Some people get a rush out of saving money, a feeling of "Ha! I beat the system." To them, saving money is a form of entertainment , and there's certainly far worse hobbies to have from a well-being perspective. Unfortunately, there are people who take this too far and end up as total misers or compulsive hoarders. I'm not a pathological case, but I've done things that would make some people cringe. - Seeing people successfully live frugally can be a motivator to follow in their path. My parents are immigrants who worked hard and saved for 20 years before they were finally able to afford a house in an expensive neighborhood (and nearly paid for it all in cash). They drive Toyotas, shop at Costco, and cook at home. They are basically the epitome of the "millionaire next door" . - There's also a moral justification for this. "Why do I have to keep up with my spendthrift neighbors? So what if I don't drive a Maserati or carry a Hermès bag? No thanks, I shall be comfortable in my own skin, since envy and greed are evil." This is now an identity statement , and while it's a good position to take from a financial perspective, it can be crippling in the way it makes some people closed-minded. Of course, this doesn't necessarily stop them from pontificating about retirement at 30. I do still think that my years of being cheap are starting to pay off, mostly because I'm finally getting comfortable with the sort of "discretionary" expenses you mentioned in your post. The difference is that it probably took a much larger bank balance for me to consider them "affordable." I just flew across the continent purely on a whim to visit some friends that I hadn't seen in years, I no longer cringe at expensive bar tabs if they were time well spent with buddies, I can afford to make an impulse electronics purchase just to see what it's like, and I'm preparing for that self-funded sabbatical  to reboot my life. Was it worth it? Well, it was really, really hard to re-orient myself this way, and it took much more sacrifice than necessary, but the good news is that aside from lost time, most of the rest hopefully can be recovered.